Cora's first gift was this great sled. We spent Christmas Eve with Joel's family and the grandkids each got a big gift from Joel's parents after breakfast. Cora loved to just sit in the sled. Now we need some snow! Working very hard to decorate a gingerbread house. We tried REALLY hard to get a family "Christmas" picture. You know, one where everyone is looking and smiling. This is our best! Cora claps for everything now. The cousins all put on their Christmas jammies to open presents in the evening. They wanted a picture with Cora too, but she kept trying to crawl away. Henry tried really hard to hold onto her. Christmas morning we spent at home by ourselves. It was such a nice relaxing day and so fun to celebrate Christmas with our new family of three. Cora had to spend some more time in her sled. She loved crawling over to the Christmas tree and presents. And this was her first present from Grammy, I mean "Santa". We had two more Christmas gatherings in Nebraska with Joel's family, but I managed to not take a single picture. Oops! New Year's Day we celebrated Christmas with my family. Ellie was the Christmas elf and helped everyone open their presents. Cora was quite grumpy this day. I think she was DONE celebrating Christmas. She would only go to Grammy. MORE presents to open. Cora was very spoiled! Thank you everyone! And I tried to get a picture with Cora too, but she wouldn't look at the camera. Like I said, I think she had enough parties and pictures. Hope you had a Merry Christmas! This is Cora's new cousin. Tripp Donald Beverlin was born to my brother Matt and his wife Rachel on Christmas Eve. 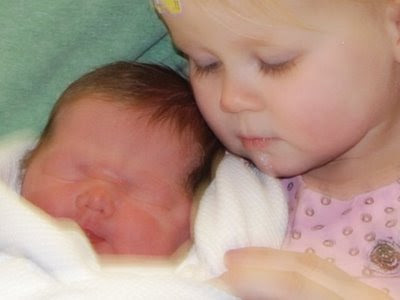 Look how sweet his sister Ellie is with him! I can't wait to meet my new little nephew. Congratulations Matt and Rachel! If you want to see more pictures check out Rachel's blog. I "borrowed" this picture from her. So Joseph also went up from the town of Nazareth in Galilee to Judea, to Bethlehem the town of David because he belonged to the house and line of David. While they were there, the time came for the baby to be born, and she gave birth to her first born, a son. She wrapped him in cloths and placed him in a manger, because there was no room for them in the inn. After the kids finished acting out the Christmas story they sang Happy Birthday to Jesus. There is nothing sweeter than hearing those little voices sing to Jesus! Merry Christmas! Too busy to blog last week. I managed to get all the Christmas cards addressed and headed to the post office on a VERY cold and snowy day. This is the ONE convenience we have living in the country. We have a cute little post office right by our house and there is NEVER any lines to wait in. I love it! Cora had to get bundled up for our outings. How do you like the black eye? We aren't really sure where that came from!? The presents are wrapped and under the tree. I LOVE wrapping paper and ribbon. Wrapping presents is one of my favorite parts of Christmas. Weird, I know. Cora got to open her first Christmas present at a Christmas party we went to. Of course, I think she liked the paper more than the gift! At our Christmas party we had a white elephant gift exchange. Joel and I had fun digging through our basement to find the "perfect" gift. You would be surprised to know what treasures we have. I was disappointed not to get this beautiful wig. Joel Smith is aging so nicely, don't you think? No wig, but Joel did get this new outfit. Nice! We also hosted a Christmas party for our small group. Another white elephant gift exchange AND an ugly sweater contest. The best was a Christmas vest with a musical tie. Even little Emry had a Christmas sweater. Joel's sister was in the Homecoming Court. She is the one in the pink dress on the left AND the new Miss Berean. She looked beautiful! My camera battery died, so this is the best picture I have. Congratulations Ivy! We had a Christmas gathering at Fred and Ruth's house on Saturday. Here is Cora with all her cousins on Joel's side. Man, it is hard to get little kids to all look the same direction for a picture. They are a cute bunch though! And in between all these events I have spent some time at the doctor's office. My little girl is STILL not better. She is using a breathing machine now, has had three shots, and started a new antibiotic. Poor baby. Poor tired mom and dad. I am ready to have my happy little girl back. Hopefully by Christmas. That leaves only two days!! I thought Cora would enjoy playing with all the Christmas decorations as I put them up. She did for about one second. She has been fighting an ear infection for over a week now. Two visits to the doctor. Two antibiotics. I'm still not sure if she is better. When I set her down to try to get something done it usually turns out like this. Lots of crying. Poor baby. Let's just say not much is getting checked off my Christmas "to-do" list. Hopefully Cora will be well enough to enjoy all the festivities. Hope you are getting lots checked off your Christmas list! That describes my weekend. Shopping, shopping, and more shopping. With a few birthday parties in between. We braved the Black Friday craziness. Rachel and I headed to Wichita at 5:30am. My sister had already been to Walmart at 5:00am and met us at Target when it opened. As you can see by all the bags we got some pretty good deals. I think I am getting too old for that early morning shopping. I was tired! We came home to celebrate this little girl's birthday. She was so excited! Ellie got lots of fun little girl presents. This is her new doll cradle and dolly from Gramps and Grammy. My mom made that cute little quilt. My dad was helping with the present unwrapping. He always put a goofy bow on his head when we were little too! Ellie got a play kitchen from her other grandparents. Cora liked it too! And here is the little two year old. Happy Birthday Ellie! And yes, a little more shopping. My sister-in-law, Leah (on the far right), turned 30 on Thanksgiving day. We all surprised her on Saturday morning and stole her away for the day. We headed to KC for a girls day of shopping. I kept forgetting my camera, so this is the only picture I have. Happy Birthday Leah! We had a wonderful Thanksgiving with SO much to be thankful for! We spent Thanksgiving with my family at my parent's house. My mom bought this cool cardboard house for Ellie. You can even color it. She thought it was great and was zooming (as you can see in the picture) in and out of it. She especially liked it when someone would come in with her. What a fun grammy! There was lots of fun cousin time. Ellie liked giving Cora hugs and kisses. This reminded Anne and I of our childhood days. My sister was ALWAYS smothering me with hugs and kisses and I HATED it. I was a child who needed my space. Cora may be a little bit like her mamma! My grandparents joined us for Thanksgiving. It was great having them! Grandma helped take good care of Cora during all the festivities. Here are the boys working so hard cutting the turkey. I'm not so sure about that grandpa in the overalls though. It looks like he may just be eating the turkey! I didn't get a picture of my mom in on the cooking action. She did MOST of the work. Thanks mom for the delicious meal! Our Thanksgiving dinner was followed by lots of laughs. It was so fun to sit around and be goofy together. This was the reason for a lot of our laughs. We got out the play dough for Ellie, but I think the grownups had more fun with it. It turned into a whole story...with characters and play dough food. Joel was the photographer and I have TONS of pictures of the "play dough drama". Maybe we will save that for another post! Hope you all had a wonderful Thanksgiving too!